Headings not only play a great role in the betterment of look and feel but also help in SEO point of view. In HTML we have heading from H1-H6 and we can use them for the different purpose and at the different place. In WordPress we generally use H1 heading for blog title which we can see in the header portion of the page. If you want to add something in the header then you need to update header.php file in the template folder. Now you can update in style.cs (you can find this file in wp-content–> themes–> your_theme_name –> style.css) and change style of heading as below. Please add it with parent tags like title tag or other so it would not reflect with all H1 tag. Below are the result after I made changes. This heading we generally use for the post title, the comment title and sidebar title so when we apply any style on H2 then it affects all three. You can change in style.css to change all places but if you want only change in one place then please use the particular tag with H2 like “.title h2” for the change only title. I have applied same in my blog and you can see below result. so it affect only comment H2 section. If you want to change widget color, font-family, font-weight, background and many other style which give your blog more professional look. Above method can also do same but that affect all H2 and when you specify for particular class than it does not affect all. Here I am showing you way to change only widget style. In style.css you can add .widget-title class like below. Below you can see result once you put this code in style.css. We can use these tags for post headings that help in separation of one point from another so you do not need to specify any character or space when other topic start in same blog. 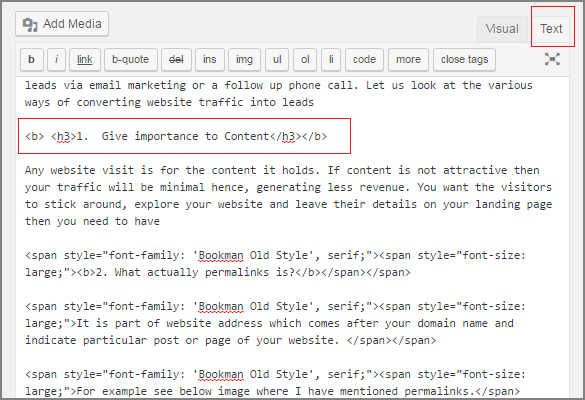 If it is not specify in your blog then you can add in editor section of text like below. 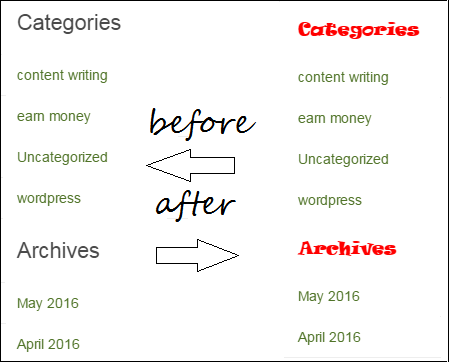 Once you update this then it look like below in your blog. Similar to above you can use these in sub-heading part of blog post which specify sub-point of your main heading. Note: Please take backup of style.css or any file which you want to change so it would be recover when something wrong happen by mistake. Use above technique to make changes in any style of your blog and make your blog more professional and beautiful.